Orange and Silver Line Metro trains are no longer single-tracking Friday morning between Ballston and East Falls Church. 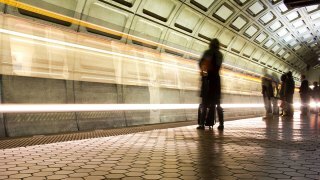 Metro said earlier that residual delays were continuing in both directions, but normal service resumed shortly before 8 a.m.
Single-tracking begain at about 6 a.m. Friday and ended about an hour later. Metro said it was due to a disabled work unit outside of the East Falls Church station.